Going up against an NXT house show in the same city, ROH's Survival of the Fittest tournament kicked off in San Antonio last night. 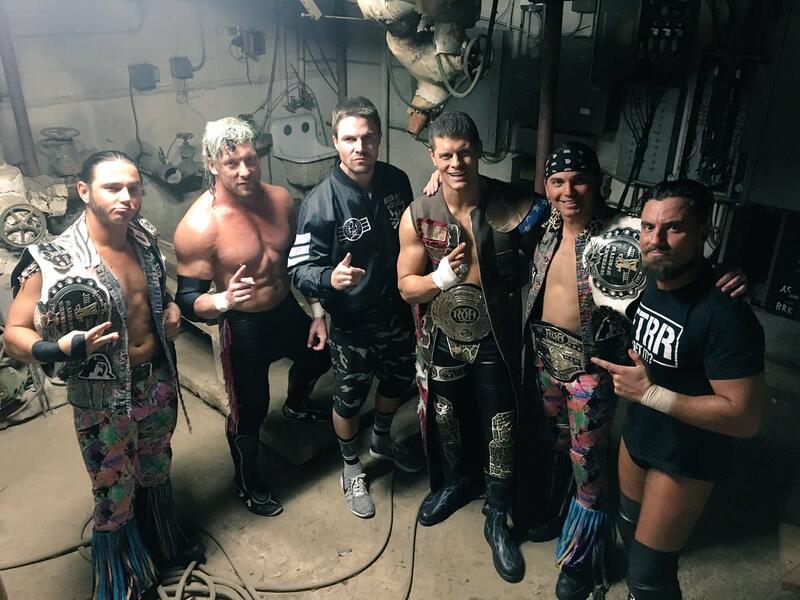 In the main event, Stephen Amell (the star of Arrow) teamed with Kenny Omega, Cody Rhodes & The Young Bucks against The Addiction, Flip Gordon & Scorpio Sky. This was the pre-show match. Cheeseburger won with a Shotei and a diving double stomp. - Amell came out as the guest host for the show. The Addiction quickly interrupted him, but Cody defended his buddy. Amell took off his jacket to reveal an Arrow-inspired Bullet Club shirt. The Addiction proposed changing the two scheduled tag matches (them vs. Omega & Cody and The Young Bucks vs. Flip Gordon & Scorpio Sky) to The Addiction, Gordon & Sky vs. Bullet Club. Cody accepted the proposal. During both the opening and closing promo, Cody pointed out that ROH's show sold out while NXT's didn't. This was a very good "mean guy match." Taylor won with a punch. Martinez hit his sit-out chokeslam to win. Marty Scurll, who is facing Lethal at Final Battle, came out during the match and offered Lethal his umbrella as a weapon. Lethal hit Scurll with it instead. Taven cradled Gresham for the pin after blocking a Shooting Star Press with his knees. Purrazzo submitted her with a Fujiwara armbar. This was a wild match, with the crowd very into the CMLL guys. Esfinge pinned Ferrara with a lucha cradle. They had a typical Joey Ryan match before King retained with the Royal Flush. Castle hit the Bang-a-Rang to win. This match was five-on-four with Amell becoming an official participant in it. He did a lot, including a dive to the floor and being put through a table by Christopher Daniels and Frankie Kazarian. He looked good for a non-wrestler. Gordon stopped Daniels from using a chair, which led to a brawl. Gordon and Sky then abandoned The Addiction. The finish was a double Indytaker as Omega and Nick Jackson did the move to Kazarian and Matt Jackson and Amell hit it on Daniels. Bullet Club did their usual post-match promo, referencing the NXT show in San Antonio. Omega said he and Cody were going back to the autograph table to sign for all of the fans who they couldn't get to earlier.